Episcopalians to join wide range of weekend events honoring Martin Luther King Jr.
[Episcopal News Service] Dioceses and congregations churchwide are planning events this weekend, from worship services to forums, for Episcopalians and their communities to honor the Rev. Martin Luther King Jr.
King, whose federal holiday will be celebrated on Jan. 21, was born 90 years ago on Jan. 15, 1929. As a Baptist preacher in Montgomery, Alabama, and Atlanta, Georgia, he was the leading voice and icon of the civil rights movement in the late 1950s and 1960s until his assassination in 1968. Presiding Bishop Michael Curry will mark the holiday weekend by participating in a panel discussion during a King event at 3 p.m. Jan. 20 at the Apollo Theater in New York’s Harlem neighborhood. “Unsung Champions of Civil Rights from MLK to Today” will feature a mix of one-on-one interviews and panels focusing on King’s legacy and other civil rights figures. More info and a link to a live stream of the event can be found here. Daylong activities are planned at All Saints Episcopal Church in Pasadena, California, on Jan. 21, including a continuous reading, over eight hours, of King’s speeches, sermons and writings. The event, “Let Freedom Ring,” will be held in the church’s nave. The Rev. Mike Kinman, rector at All Saints, said the marathon of readings was an idea he hatched years ago while serving as dean of Christ Church Cathedral in St. Louis, Missouri. It stemmed from his personal tradition of reading from a collection of King’s writings and speeches every year on the federal holiday. This will be All Saints’ third year hosting a similar marathon of King’s words. Some congregations are planning to join large community celebrations. In St. Petersburg, Florida, the city’s Episcopal churches will participate in a Martin Luther King Jr. Day parade, said to be that longest-running parade in the country to honor King. In the Diocese of East Tennessee, eight or nine Episcopal parishes and ministries are expected to march in a Martin Luther King Jr. Day parade in Knoxville, with the Episcopal School of Knoxville entering its own float. In Austin, Texas, St. Matthew’s Episcopal Church will join a downtown march on Jan. 21, starting at the King statue on the University of Texas’ campus. The Diocese of Georgia is continuing its tradition of participating in an annual parade in Savannah, which typically includes a diocesan float and up to 100 Episcopalians. A post-parade Eucharist will be held at St. Matthew’s Episcopal Church, Savannah. At other churches, the congregations are inviting the public inside for more intimate commemorations. St. Columba’s Episcopal Church in Washington, D.C., will celebrate King’s life and legacy at its two Sunday services Jan. 20 and follow up with the launch of a series of forums, “Instruments of Change: From White Guilt to Empowered Ally.” Church of the Holy Spirit in Lebanon, New Jersey, will host a service at 7 p.m. Jan. 21 that will feature readings from King’s “Letter from Birmingham Jail,” as well as cello and organ music. The series of events hosted by All Saints in Pasadena will include a Diocese of Los Angeles event at 3 p.m. Jan. 20 featuring music by the Episcopal Chorale Society and a speech by Devon Carbado, a law professor at the University of California, Los Angeles. Service work is another common theme of Episcopalians’ plans for honoring King’s calls for justice. The Diocese of Long Island’s Office of Youth & Young Adult Ministries is organizing a day of service work at two locations on Jan. 21. Young people will bag about 15,000 meals for a feeding ministry from 1 to 3 p.m. at St. John’s Episcopal Church in Cold Spring Harbor, New York. Then from 3:30 to 7:30 p.m., they will greet guests and help serve a weekly community meal at Christ Episcopal Church in Babylon. Chattanooga, Tennessee, churches are participating in a local Day of Service on Jan. 21, as well as the city’s march and worship service. St. Matthew’s Episcopal Church in Liverpool, New York, also has service activities planned for its parishioners. Trinity Episcopal Church in Swarthmore, Pennsylvania, will spend the morning Jan. 21 packing breakfast bags and making hot meals for residents confined to their homes. The Rev. 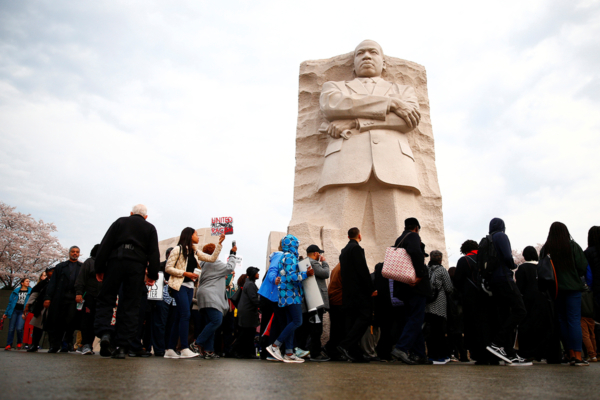 Jarrett Kerbel, rector at Episcopal Church of St. Martin-in-the-Fields in Philadelphia, took that message a step further in a blog post this week looking ahead to Martin Luther King Jr. Day. He urged Episcopalians to see the holiday as not just a day of service but a day of action. St. Martin-in-the-Fields is partnering with the interfaith organization POWER Philadelphia in offering a schedule of activities for the MLK Day of Action, including a rally outside a McDonald’s to call for a minimum wage increase and a “teach-in” to rally behind public policies that will improve education.